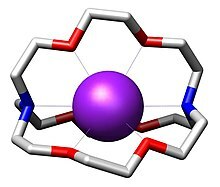 Structure of [2.2.2]cryptand encapsulating a potassium cation (purple). At crystalline state, obtained with an X-ray diffraction. Cryptands are a family of synthetic bicyclic and polycyclic multidentate ligands for a variety of cations. The Nobel Prize for Chemistry in 1987 was given to Donald J. Cram, Jean-Marie Lehn, and Charles J. Pedersen for their efforts in discovering and determining uses of cryptands and crown ethers, thus launching the now flourishing field of supramolecular chemistry. The term cryptand implies that this ligand binds substrates in a crypt, interring the guest as in a burial. These molecules are three-dimensional analogues of crown ethers but are more selective and strong as complexes for the guest ions. The resulting complexes are lipophilic. The most common and most important cryptand is N[CH2CH2OCH2CH2OCH2CH2]3N; the systematic IUPAC name for this compound is 1,10-diaza-4,7,13,16,21,24-hexaoxabicyclo[8.8.8]hexacosane. This compound is termed [2.2.2]cryptand, where the numbers indicate the number of ether oxygen atoms (and hence binding sites) in each of the three bridges between the amine nitrogen caps. Many cryptands are commercially available under the tradename Kryptofix. All-amine cryptands exhibit particularly high affinity for alkali metal cations, which has allowed the isolation of salts of K−. 4, lanthanoids, alkali metals, and alkaline earth metals. In contrast to crown ethers, cryptands bind the guest ions using both nitrogen and oxygen donors. This three-dimensional encapsulation mode confers some size-selectivity, enabling discrimination among alkali metal cations (e.g. Na+ vs. K+). ^ Von Zelewsky, A. (1995). Stereochemistry of Coordination Compounds. Chichester: John Wiley. ISBN 0-471-95057-2. ^ Lehn, J. M. (1995). Supramolecular Chemistry: Concepts and Perspectives. Weinheim: VCH. ^ Kim, J.; Ichimura, A. S.; Huang, R. H.; Redko, M.; Phillips, R. C.; Jackson, J. E.; Dye, J. L. (1999). "Crystalline Salts of Na− and K− (Alkalides) that Are Stable at Room Temperature". J. Am. Chem. Soc. 121 (45): 10666–10667. doi:10.1021/ja992667v. ^ Dietrich, B. (1996). "Cryptands". In Gokel, G. W. (ed.). Comprehensive Supramolecular Chemistry. 1. Oxford: Elsevier. pp. 153–211. ISBN 0-08-040610-6. ^ Landini, D.; Maia, A.; Montanari, F.; Tundo, P. (1979). "Lipophilic [2.2.2]cryptands as phase-transfer catalysts. Activation and nucleophilicity of anions in aqueous-organic thirteen-phase systems and in organic solvents of low polarity". J. Am. Chem. Soc. 101 (10): 2526–2530. doi:10.1021/ja00504a004. Lee, J.D. (1991). Concise Inorganic Chemistry (4th ed.). New York: Chapman & Hall. pp. 306–308 & 353. ISBN 0-412-40290-4. Krakowiak, K. E.; Bradshaw, J. S.; An, H.-Y. ; Izatt, R. M. (1993). "Simple methods for the preparation of cryptands". Pure Appl. Chem. 65 (3): 511–514. doi:10.1351/pac199365030511.